Boxer Josh Taylor says he is hoping for some valuable ring time in Manchester tonight as he goes head to head with Frenchman Lyes Chaibi. 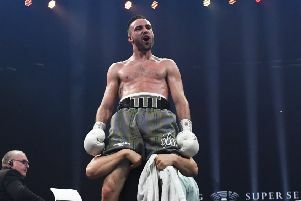 The 25-year-old Prestonpans fighter is boxing on the undercard of Carl Frampton’s much-anticipated unified IBF and WBA world super bantamweight showdown with Scott Quigg. But, despite enjoying a flawless start to life as a paid boxer since teaming up with Barry McGuigan and Cyclone Promotions last summer which has culminated in three consecutive knock outs, Taylor is yet to go beyond the second round. Predicting Chaibi will pose his toughest test so far, the 2014 Commonwealth Games gold medalist said: “It certainly looks a difficult fight on paper and a step up in class. He’s had a good number of fights and last boxed for the IBF Inter-Continental title over 12 rounds so it’s going to be tough. But I think that will bring out a better performance from myself. “Don’t get me wrong, if I can get the guy down then I’ll get it done. But I think it could take me a good few rounds to suss him out as he’s tough and durable so I am expecting a harder fight in comparison with my previous three. Taylor admits to being blown away by Edinburgh boxing legend Ken Buchanan’s recent prediction that he has the ability to win a world title within the next five years.